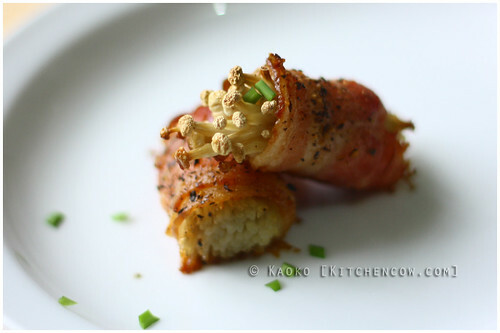 Enokidake and bacon rolls are an ubiquitous appetizer in local Japanese restaurants. I used to tell myself I should stop ordering them since I can probably make them at home, but forget when faced with the menu. When I finally had enough, I tried making them at home. To my surprise, it wasn’t as easy as I thought. I tried pan-frying them and broiling them but I ended up with bacon rolls that wasn’t quite the same. As a last resort, I tried baking them in a hot oven. Success! Plus, they turned out prettier too, keeping their shape even without using toothpicks. Start off with a bunch or two of enokidake. Cut off an inch or so from the roots and brush off any excess dirt. Washing enokidake can make them slimy, so if possible, stick to just dusting them off. 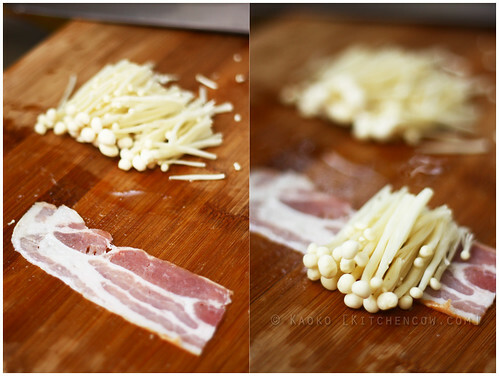 Cut your bacon into strips, depending on how big you want to bunch your enoki. Make sure there’s enough bacon to go around and to overlap under. You can use whole stalks, but in my case, I cut them in the middle after removing the roots. This means I have some pieces that don’t have mushroom caps on them. In this case, you can always combine cuts with caps and cuts without. After rolling, lay the bacon and mushroom rolls on a greased baking tray. If the rolls open, secure with a toothpick, but usually, they’ll stay in place as long as you put them seam-side down. Season with freshly cracked black pepper, then bake in a preheated 425-degree oven. For 15 minutes or so. Different brands of bacon may brown differently so it’s best to check occasionally to ensure that the bacon browns before the mushrooms burn. Let cool a teeny bit before serving. Sprinkle with chopped spring onions or chives. See how easy? 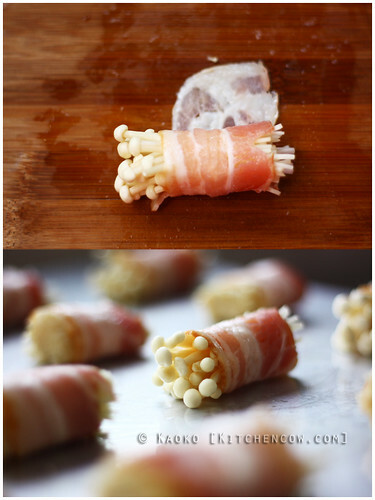 These enoki and bacon rolls are great for entertaining too. Roll them up ahead of time, refrigerate (up to overnight), then bake just before the guests arrive. 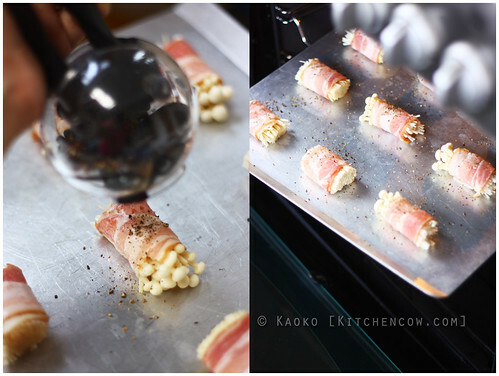 Your home will be filled with wafting bacon smells that they’ll be drooling before they’ve even put their things down. Only thing missing is the teriyaki sauce to kick the flavor up a notch. I prefer mine without. Though when I make gyu asupara rolls, I use a teriyaki-like base. hmmmnnn..haven’t tried enoki mushrooms that way! NAKS NAMAN! Peechur naman jan, Chef Shakey! Sige I’ll try to make a batch again. I always forget to take pictures when it comes to food eh. Half eaten na before I remember. Lol! your step by step really good! i made it. i added with grill sauce while in the oven. it’s actually came out good. i also try making with shiitake mushroom, it came put nice too. So glad it helped you Ayune! And thank you for the shiitake suggestion. I love shiitake too, I’ll try that next time.